The Unity Party of Nigeria (UPN) has thrown its weight behind the suspension of the Chief Justice of Nigeria (CJN) Walter Onnoghen, by President Muhammadu Buhari, over the CJN’s failure to fully declare his assets. 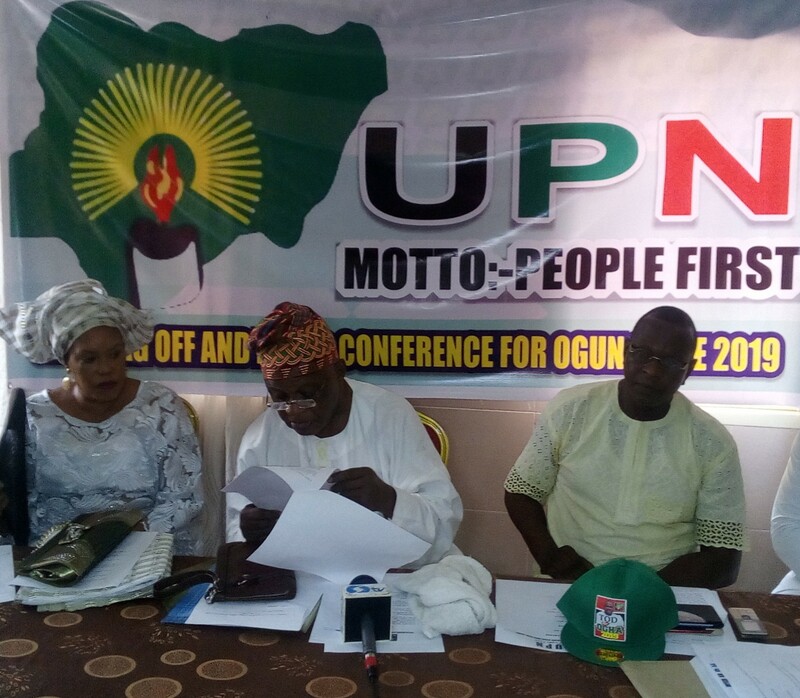 The party’s position was made known on Tuesday by the UPN national chairman, Professor Bankole Oluwaseun, during the official presentation of the party’s governorship and deputy governorship candidates in Ogun State, Femi Adeeko and Adebunmi Bankole, to the party faithful in Abeokuta. Okuwa, who berated some members of the Nigeria Bar Association and other professional bodies, over their stance against the president’s decision, argued that the president had acted in good faith by suspending Onnoghen. He said the honour and ethos of responsibility and integrity in public office should have been the guide of the CJN, when his claims became doubtful and suspicious at the Code of Conduct Bureau, noting he should have steppes aside for proper investigation to take place. He, however, said that the decision of President Buhari would not only restore sanity into the Nigeria judicial system, it would also show to the world the president’s commitment to tackle corruption. While calling on Nigerians to rally round the president in his determination to purge Nigeria elite and political class of corrupt tendencies and practices, UPN national chairman declared that “our party will always support and encourage the president to continue attacking corruption anywhere they exist in the interest of building worthy nation of the largest black people in Africa and the world”. “The honour and ethos of responsibility and integrity in public office should have been the guide of CJN Onnoghen, when his claims became doubtful and suspicious at the Code of Conduct Bureau. He should have stepped aside for a proper investigation of him instead of keeping mute, encouraging meaningless uproar from his blind supporters all over the country. “The Nigeria political arrangement tends to give the judiciary an unnecessary clout which it is not supposed to have except in a parliamentary system of government. The suspension Saga of Chief Justice Onnoghen by President Buhari may result in our presidential system highlighting the blind error of operating a judiciary which is typical of a parliamentary setting of governance. “President Buhari remains a catalyst of any kind of presidential system as known anywhere. The Nigeria Bar Association and other professional bodies who are crying foul should first of all request the CJN to declare publicly, what he entered on his assets form and if he left any questionable information out, he should tell Nigerians why”. Okuwa submitted. Tags: Chief Justice of Nigeriapresident muhammadu buhariunity party of nigeriaWalter Onnoghen.